For Labrada Nutrition founder Lee Labrada,developing the most effective sports nutrition supplements is a passion. Lee brings the same pursuit of excellence to the design of his sports supplement line thathe did to developing his classic, world-renown, Bodybuilding Hall of Fame physique. we essentially broke the formula down to its most basic parts, in a similar fashion to how a mechanic breaks down a high-performance race car engine. We then rebuilt the formula from the ground up. The result is truly amazing. We have developed a pre-workout supplement that not only produces better workouts than any other product we have tested, but also provides all of the key bodybuilding supplements a serious athlete could want, in effective, result-producing amounts. Super Charge!® is head and shoulders above any other pre-workout on the market, for many reasons. For starters, we provide over 10 performance enhancing actives, in the same effective amounts that are backed by human studies. None of this pixie dust sprinkle stuff you find in some other pre-workouts. It’s all clearly spelled out on the label, concise and precise. 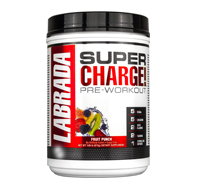 Super Charge!® is made in a certified cGMP and FDA inspected facility, and like all Labrada products, tested by a third party independent lab to confirm that it meets label claim. If you’re looking for a product that makes all of the difference in terms of strength, endurance, and performance,look no further. Super Charge!® is IT! What makes NEW Super Charge!® the BEST pre-workout supplement available today? Super Charge!® contains EFFECTIVE AMOUNTS of 10 performance enhancing ingredients, formulated in accordance with the dosing guidelines of published human trials and studies. Super Charge!® DOES NOT CONTAIN ineffective sprinkles ofactive ingredients, which is common in some pre-workout formulas containing proprietary blends. Super Charge!® gives you effective amounts of performance enhancing active ingredients, so you get GREAT workouts and GAINS in strength, endurance, mental focus, and recovery. Super Charge!® is designed to optimize and enhance your strength, endurance, mental focus and recovery so you can push through your workouts with greater drive and motivation. Each ingredient in Super Charge!® is engineered into its formula to achieve a desired training effect. While many competing pre-workout and pre-workout concentrate supplements are formulated using a “kitchen sink” approach, their formulas often prove ineffective because they don’t contain enough of each active ingredient to achieve a desired training effect. For example, one pre-workout supplement might contain a great energy blend, which gives the user extra mental energy; but falls short on increasing workout strength. Another pre-workout supplement might increase workout strength; but doesn’t do enough to give the user a good pump. You get the picture. Super Charge!® contains a FULL SPECTRUM of performance enhancing active ingredients in EFFECTIVE AMOUNTS to optimize and enhance your strength, endurance, mental focus, and recovery. • An effective amount of BCAA helps to turn on the anabolic switch leading to muscle growth after your workout. • An effective amount of CreaPure® creatine monohydrate helps to increase your strength for your next workout. • An effective amount of CarnoSyn® beta-alanine helps tobuild carnosine stores in your muscles... which buildsup your workout endurance! Super Charge!® is MUCH MORE THAN A GREAT PRE-WORKOUT supplement. It’s 24/7 support for your muscles andperformance, all-in-one daily serving. Clear, Concise and Precise – The value of a pre-workout supplement should be easy to determine by reading theproduct label. The information provided on the Super Charge!® label is designed to provide you with CLEAR details about the ingredients. This lets you know that not only are proven and effective ingredients present in Super Charge!® but also that these ingredients are present in amounts reported to be effective in clinical trials. Too often, athletes are forced to guess about the contents of products marketed by other companies through their use of “proprietary formulations.” It is important that the information on the label be usable, without confusion over the use of uncommon (or incorrect) scientific names for otherwise familiar ingredients. The Super Charge!® product label is designed to quickly show the ingredients, grouped together by the training effects they support. Whether you are looking for a “pump,” strength, or increased mental drive, you can easily find them without trying to decipher chemical babble. 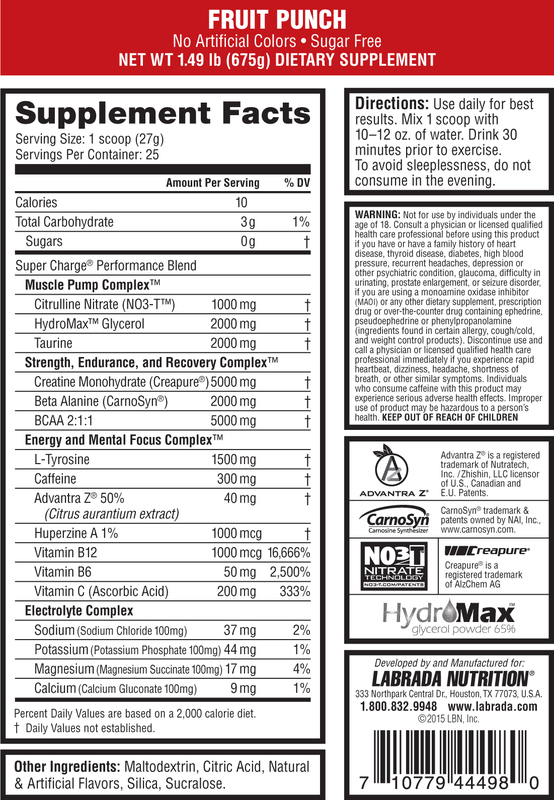 Labrada Nutrition gives you a label that is CONCISE. That’s TRUTH in LABELING. Product labeling should mean what it says. Labrada Nutrition performs independent 3rd party product testing at analyticallabs to ensure that Super Charge!® meets the label claims. Every lot of Labrada products is tested to ensure the contentsare PRECISE. Labrada Nutrition has been performing independent 3rd party product testing at analytical labs for over 20 years,and has received a Federal Trademark registration for Lee Labrada’s well-known product quality guarantee: If it's on the Label, It's in the Bottle! NO3-T™ (citrulline nitrate) – Getting greater delivery of energy and oxygen to your working muscles and flushing away metabolic wastes is dependent upon getting enough blood flow. of nitric oxide (NO), a gas that helps dilate blood vessels and increases blood flow to working muscles. With increased blood flow we increase our performance capacity and our muscles get pumped. NO3-T™ Citrulline Nitrate helps the body produce nitric oxide through two different pathways. While arginine is often included in pre-workout formulations as a NO ingredient, citrulline has a much greater bioavailability than arginine. That allows it to efficiently reach the bloodstream, and travel to the kidneys which then converts it into arginine. Thisimproved route of arginine delivery increases the uptake of arginine by cells lining the blood vessel, and an enzyme (eNOS) converts it into NO when demand is high. Nitrates (NO3) are converted into nitrites (NO2) in the stomach or in the “stressed” blood vessel; nitrites are the IMMEDIATE source of nitric oxide (NO). NO3-T™ provides both sources (citrulline:slow and nitrate:fast)for NO production, taking advantage of two distinct but complementary pathways. The result? Greater blood flow to the working muscle for an enhanced pump and greater work capacity. Creapure® Creatine Monohydrate – is the most potent and well-studied sports supplement ingredient for strength and mass building. Creatine is turned into creatine phosphate and stored in the body, including muscles. Creatine phosphate helps make adenosine triphosphate (ATP), which is what fuels your muscles. Creatine stores in the cell can be increased considerably through supplementation, and need to be regularly supplemented to maintain an elevated level. Creatine may help athletes achieve bursts of speed and energy, especially during short bouts of high-intensity activities such as weight lifting or sprinting. Athletes are better capable of recovering, building and maintaining greater muscle mass with creatine. Branched Chain Amino Acids (BCAA) – consist of three amino acids – leucine, valine, and isoleucine. BCAAs play a significant role in building and repairing muscle, and also act as a “signal” to your muscles that nutrients are available for increasing muscle mass. Contractile (muscle) proteins are damaged during exercise, and muscle cells will use BCAAs to buffer the loss of certain non-essential amino acids or to provide energy during long periods of exhaustive training. Leucine is one of the most important BCAAs as it stimulatesprotein synthesis in the body, reduces catabolism, and lessens fatigue during your workouts. Having leucine in the proper ratio with the other BCAAs is critical. The 2:1:1 ratio BCAA blend (2 leucine: 1 isoleucine: 1 valine) found in Super Charge!® has been shown to be the optimum ratio in providing both amino acids as building blocks AND taking advantage of leucine’s role as an anabolic signal in the muscle cell. Carnosyn® beta-alanine is a naturally occurring amino acid that can increase endurance for athletes. Beta-alanine joins with the amino acid histidine through a peptide bond to form carnosine in the muscle. Carnosine is the major buffering agent, or neutralizer, of hydrogen ions that lead to muscle fatigue and failure in muscle. Intense and prolonged work generates the buildup of hydrogen ions in your muscles which are the damaging factor in lactic acid buildup, and lowers the pH of your muscle cells. As the pH drops, critical molecular reactions are slowed down. Carnosine absorbs the hydrogen ions, giving the muscle the ability to work longer at a high intensity level. Supplementing with CarnoSyn® can reward you with more result- producing reps during your sets, delaying the onset of failure; and can allow you to recover between sets faster. Taurine is an amino acid that helps increases muscular forceproduction, and improves aerobic and anaerobic athletic performance. Taurine is essential for cardiovascular function, activation of skeletal muscle and the central nervous system. In muscle cells, taurine keeps potassium and magnesium inside the cell, while keeping excessive sodium out. Taurine is present in high concentration in skeletal muscle, and is released during intense or prolonged exercise. Taurine serves as a potent anti-oxidant in the mitochondria – the powerhouse of the cell where the energy molecule ATP is produced. Studies involving taurine have shown it to increase alertness and performance, and it may relieve post-exercise muscle soreness. The effects of taurine may be enhanced by caffeine. Hydromax® glycerol – Endurance athletes have long known about the positive effects of glycerol pre-hydration on prolonged exercise, especially when it’s hot. Dehydration, or the loss of body water through sweat and breathing, occurs during exercise. If you’re training intensely for growth, you can get dehydrated to a point where your performance is affected negatively, and your risk of injury increases. Hydromax® glycerol is easily absorbed, increasing the concentration of fluid in your blood and tissues. Glycerol taken shortly before your workout will promote vascularity, and later in the workout aids in drawing water back into your muscles. By increasing hydration, you enjoy more endurance and stamina, increasing your body’s ability to adapt and push through workouts even when it’s hot. L-tyrosine – is an amino acid that serves as a precursor totwo important neurotransmitters, dopamine and norepinephrine;as well as being a building block for proteins formed in thebody. L-tyrosine improves alertness, mental performance, and energy. L-tyrosine is in a class of supplements called nootropics. Nootropics work in the brain to increase cognition, focus, and alertness. L-tyrosine is an ideal amino acid to use before a workout to increase mental drive. Caffeine – Is a central nervous system stimulant that has been shown to reduce fatigue, improve alertness, performance, and endurance during physical and mental challenges. Caffeine works primarily by slowing the chemical breakdown of adrenalin and neurotransmitters responsible for the “fight or flight” stimulus that your body sends in the form of extra force, faster reaction speed, and increased pain tolerance. Not only does caffeine prolong an initial burst of activity, it enhancesenergy availability at the same time by promoting the release of sugar from tissue stores and increasing the rate of fatty acidoxidation – burning fat for calories (energy). Advantra Z® (50% Citrus aurantium) is a source of p-synephrine, which has been shown to increase metabolic rate and energy expenditure. Synephrine produces most of its biological effects by acting as an agonist at (i.e. stimulating) adrenergic receptors (which include receptors for noradrenaline). Advantra-Z® works particularly well with caffeine to support continuous work at a higher intensity. Advantra Z® is derived using manufacturing methods that capture andpreserve the optimal amount of natural p-synephrine – Advantra Z®’s predominant amine that exhibits twice the physiological activity as synthetic p-synephrine. Huperzine A – is an extract of a botanical called Huperzia serrata. Huperzine A is known as an acetylcholinesterase inhibitor, which means that it stops an enzyme from breaking down acetylcholine, a neurotransmitter used in muscle contractions. Higher levels of acetylcholine are desirable during workouts because it acts upon the motor neurons that ultimately generate the action of your muscles. Huperzine A is thought to prolong the “go” signal from the brain to the muscle, and may allow for greater force to be generated, not to mention longer workouts. Vitamin B12 – is a water-soluble vitamin with a key role in the normal functioning of the brain and nervous system, and for the formation of blood. Vitamin B12 is also used for memory, boosting mood, energy, concentration, and the immune system. Supplementing with B12 improves mental function and energy levels enhancing your ability to train. Vitamin B6 – is a water-soluble vitamin that functions as a cofactor in many enzyme reactions in amino acid, glucose, and lipid metabolism. It’s important to note that exercise increases the body’s need for vitamin B6. In addition, vitamin B6 has been shown to reduce muscle cramping, something we all have experienced a time or two in the gym! Vitamin C is a water-soluble vitamin needed for the growth and repair of tissues. The purpose of pre-workout Vitamin C is for reducing oxidative stress caused by exercise. High levels of oxidative stress can slow down our muscles’ ability to contract, meaning less power, and less stamina. Vitamin C is also necessary to support connective tissue repair. of the body. Muscles and neurons are activated by electrolyte activity between the extracellular fluid or interstitial fluid, and our intracellular fluid.